This is a good day for socializing and interacting with others. As the day starts out, the Moon is in Gemini and sextiling Jupiter and Venus in Leo. There’s emphasis on creativity and camaraderie. Later when the Moon moves into Cancer and sextiles Mercury in Virgo, the energy shifts toward talking about feelings and emotions. 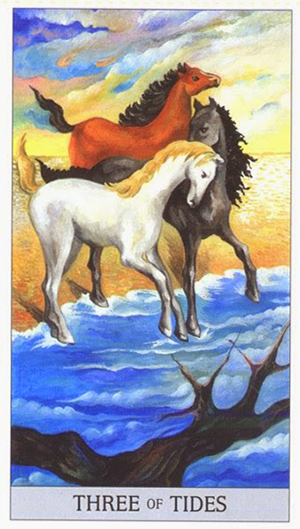 You can see this in the card with the ponies playing along the shoreline and then gingerly stepping into the tide. 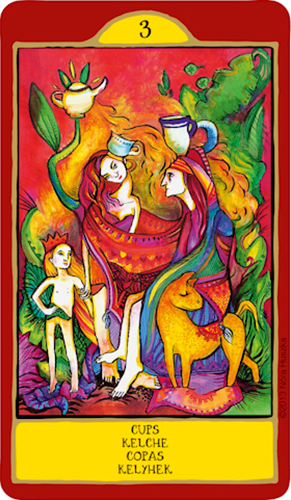 The Three of Tides — the beautiful Japaridze Tarot’s version of the Three of Cups — is about connecting with friends and interacting with others. The emphasis is on joining together with like-minded people, whether this is a planned gathering or an impromptu meeting of the minds. It’s a happy, joyful energy that can manifest as a party or celebration, or it could be as simple as a girls’ (or boys’) night out. Either way it’s a time of merriment and gaiety. Hanging out with friends and expressing feelings of affection and good-will. There’s no room for fretting about work, and none of this sitting around ironing out political or ideological differences. In terms of romance the Three of Tidess can refer to reconnecting with an old flame or reuniting with an ex. It can also manifest as a natural progression from an interest to a mutual attraction to taking things to the next level). Whether you’re celebrating your own good fortune or raising your glass to toast another’s, the Three of Tides serves as a reminder that there’s always something to be grateful for, and always someone to share your gratitude with. It’s time to eat, drink, dance and be merry. As Venus trines Uranus today, you may be celebrating something which not only involves you but also others. There is much merriment to be found and growth from interacting with others. It may be the start of a new project or the beginnings of a new idea that has taken hold in your mind. Either way it is a good idea to share it around with trusted friends and get their ideas on it. 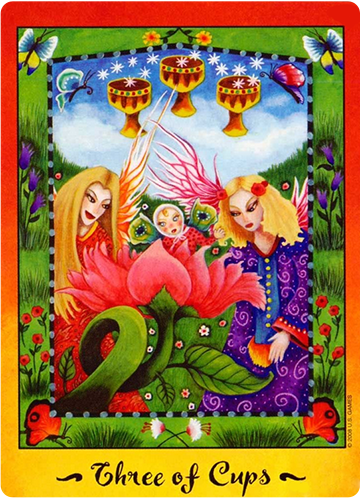 The Three of Cups — this version from Svetlana Ava’s contribution to the beautiful 78 Tarot — represents liveliness and gaiety, communing with others and a light-hearted approach to friendship. Notice the colorful fruits, berries and flowers scattered at the base of this card. And the women dancing around in merriment are just as alive and colorful. There are elements of playful reverie and joyful abandon that are shown in these young women taking part in the festivities. Nothing about today looks “heavy” for you so if you have been through a hard time lately now is the time to leave it behind and look towards the future.Know that you have like-minded people around you to life you up and support you. Your life is ready to take a new turn and within this you are filled with such happiness that nothing and no one will stand in your way. In fact if they did you would probably just laugh in their face. It’s time to dabble in new experiences and taste new life experiences. It’s time to let go of the past and begin a brand new day. It’s time to be grateful and spread that gratitude around because as you do it will come back to you again and again. This month you may find it necessary to make decisions that are fair and just — without regard your personal leanings. 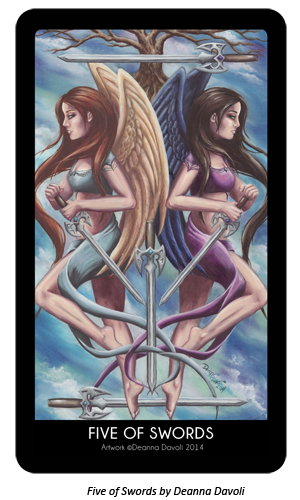 The Justice card refers to a conscious awareness of cause and effect, action and consequence, right and wrong. It may be a situation that you’re personally involved in, such as a relationship that tugs at your heartstrings but is not in alignment with your principles. Or you may be asked to mediate a disagreement among friends. It’s not about choosing sides. It’s about being able to tap into the “truth” objectively and impartially. 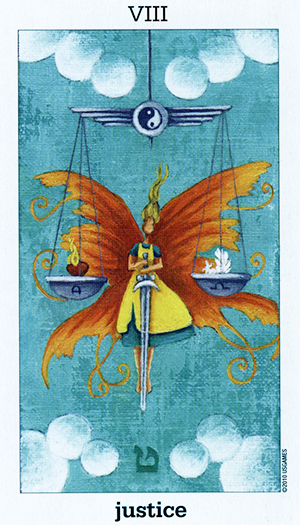 In this version of the card — from the Sun & Moon Tarot — a butterfly girl hovers in the sky behind a scale. She strives to maintain her balance using the blade of her giant sword. A flaming heart is weighed against a single white feather in the scales. A yin / yang symbol is at the top of the scales and the Hebrew letter “tet” is at the base. Among other things, the tet symbol refers to wisdom and truth. 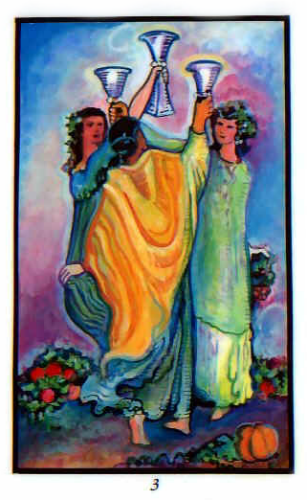 The Justice card speaks of balancing head against heart and desire against logic. While we all strive to keep these areas in sync, it’s a constant and precarious battle. Sometimes the heart rules and sometimes it’s the head. But if you rise above the situation (like the girl in the card) you’ll be better equipped to achieve perspective. Sometimes we have to get some altitude in order to see things from outside of our earthly attachments. The Justice card encourages you to seek the answers to your most pressing concerns through objectivity and conscious awareness. If you rely too much on head, heart will suffers and vice versa. But if you can find a way to balance the two, the truth will reveal itself in the end. With Venus sextiling Uranus today, it’s a good time to think about taking a break from work and responsibilities and focusing on socializing with friends and loved ones. 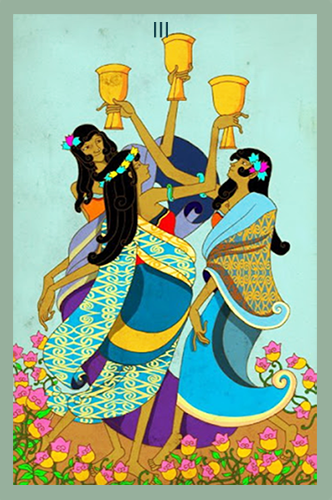 The Three of Cups represents people gathering together to connect, interact and celebrate. It’s a happy, joyful energy that can manifest as a party or celebration, or it could be as simple as a girls night out. Either way it’s a time of merriment and gaiety. Hanging out with like-minded people and expressing feelings of affection and good-will. There’s no room for fretting about work, and none of this sitting around ironing out political or ideological differences. Today’s Leo Moon (still very new) fits perfectly with the sense of joy and playfulness seen in this version of the card — from the gorgeous Nusantara Tarot. The three figures raise glasses in a celebratory toast as they frolic in a field of wildflowers. There’s a sense of sisterhood and camaraderie that is emphasized here. In terms of romance the Three of Cups can refer to reconnecting with an old flame or reuniting with an ex. 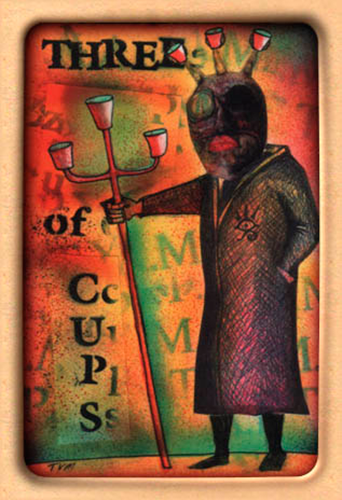 It can also manifest as a natural progression from the Ace of Cups (an attraction) and the Two of Cups (a mutual attraction) to the Three of Cups (taking that attraction to the next level). Whether you’re celebrating your own good fortune or raising your glass to toast another’s, the Three of Cups serves as a reminder that there’s always something to be grateful for, and always someone to share your gratitude with. You may feel like letting your hair down and spending your day socializing and interacting with others. 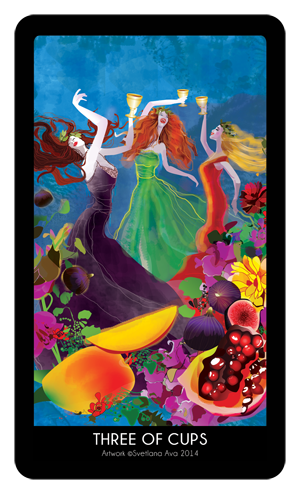 The Three of Cups — this version for Nathalie Hertz’s beautiful Faerie Tarot — is a playful and festive card that emphasizes partying and celebrating over work and responsibilities. it also emphasizes friends and casual relationships over serious romantic entanglements. It refers to being surrounded by like-minded people and putting your differences aside. It’s about coming together and joining forces with those who have your best interests at heart. As Venus trines Jupiter today, the focus is on merriment and gaiety rather than monotony and drudgery. It’s on interacting and networking with others, allowing you to push aside some of your more serious concerns — at least for the time being. It represents people gathering together to connect, interact and celebrate. It’s a happy, joyful energy that can manifest as a party or celebration, or it could be as simple as a girls night out. There’s a strong sisterhood vibe to this card — as well as most other versions of the Three of Cups — too. Pay attention to new people coming into your life too, as Venus is also opposing Uranus today. You could find yourself developing friendships with people that seem random at first but can turn into important connections over time. No matter where the people in your life have come from today — no matter what your connection or history or relationship with them is — the Three of Cups is a card of companionship and camaraderie. It serves as a reminder that there’s always something to be grateful for, and always someone to share your gratitude with. As we move into February, chances are good you’re already thinking about Valentines Day. And with Venus conjuncting Neptune today — in the sensitive, loving, romantic sign of Pisces — you could already be planning for that special day. 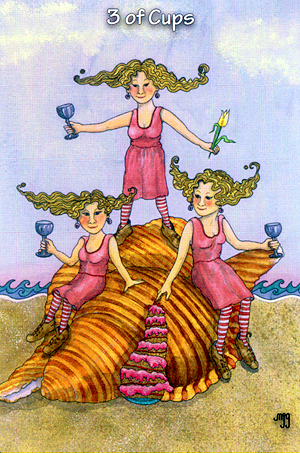 The Three of Cups is a playful and festive card that emphasizes partying and celebrating over work and responsibilities. it also emphasizes friends and casual relationships over serious romantic entanglements. The focus is on merriment and gaiety rather than monotony and drudgery. It’s on interacting and networking with others, allowing you to push aside some of your more serious concerns — at least for the time being. Pay attention to new people coming into your life today. You could find yourself developing friendships with people that seem random at first but can turn into important connections over time. This doesn’t apply only to romance by the way. Look at all the activity going on in this card. There’s a tea party going on involving at least three generations, as well as the family pets. There are feelings of community and comfort here and let’s not forget whimsy and play. Notice the teacups and colorful tapestry, as well as the child wearing nothing but a crown. The Venus / Neptune conjunction encourages you to celebrate today — even if you have nothing official to celebrate. It’s a good time to express your feelings — for friends, loved ones and family members, and those who’ve been important to you along the way. It’s the weekend and time to let your hair down, go out and have some fun and generally not worry about a thing. The Three of Cups stands for happiness and merriment. Happy times abide and though you soar in the exuberance of the “moment” remember what you do in this moment may have consequences that bring you down to earth (or diving for cover under water) at some point in the future. There’s a general sense of excitement as you know you are able to let your hair down and be social on oh so many levels. There’s the level of soaring high and being so engrossed in your own pleasure that you ignore or don’t notice what is going on around you. And of course, there’s the coming down to earth with a splash where you may have made a fool of yourself and decide that hiding your face for a while is the best thing to do so you are not too embarrassed. Then there’s all those levels of excitement in between where you can flit from one social engagement to the next or one person to the next just like a butterfly. You may even like to choose a coloured fin on one of the mermaids and imagine what that colour brings out for you and your mood. Whatever you choose to do today (or tonight) there is a sense of joy and abandonment of all your worries around it. 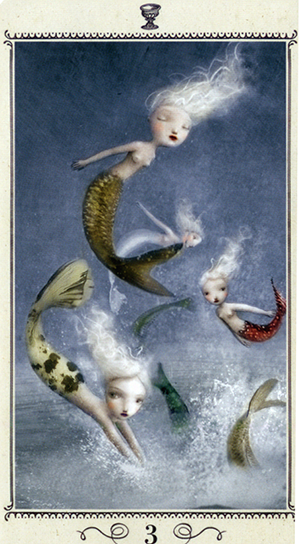 It’s as if you don’t have a care in the world and from the look on the face of the highest mermaid in this card all your cares and worries are dropping away as you soar higher and higher. This month you’re likely to be thinking more about doing business and finding your place in the world than anything else. With a line-up of planets moving through your 8th house — the area associated with joint resources and other people’s money — as well as Mars (your ruler) joining Pluto in your public sector, the focus is going to be more on career and professional achievements. The King of Swords is all about power and authority. Success, Accomplishment. Strategy. Intelligence. You’ll have all of these things at your fingertips and should be taking advantage of them — particularly in the first two weeks of the month. This is a time for putting your ideas out there — verbally or in writing — and communicating them to others. It’s not the time for ambivalence or uncertainty. Look at the King in this card. He’s a bit more colorful and flamboyant than we’re using to seeing with the King of Swords. He’s usually rather stoic and somber. But this whimsical version is just spirited enough to capture the dynamic and playful Uranus in Aries transit you’re dealing with and just dignified enough to capture the Mars in Capricorn transit you’ve got moving through your 10th house. This King says you can have the best of both worlds. It doesn’t have to be all work and no play. And you won’t get anywhere if it’s all play and no work. 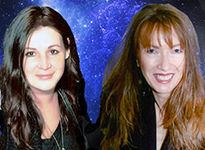 With Mercury retrograde conjunct Venus today it is not a good time to get your wires crossed. Usually the Three of Cups stands for merriment, celebration and having a good time however this image paints a different story and you may find that what you do today could come back to bite you in the future. It seems as if someone is not showing their true colours and possibly hiding behind a false persona. They may talk the talk and look good in your eyes but it is really a mask that hides who they truly are. Do not be fooled. For this reason you may like to stick to social situations that you know and are comfortable with alongside friends that can back you up if you get into any problems. Better the devil you know… as the saying goes. This is not the day to be partaking of too much alcohol. It is the day you need to keep your wits about you and not go following your heart but, rather, follow you head with any suspicious murmurings that little voice is tell you. You may be more on the mark than you think. In short even though Mercury is conjunct Venus today which is usually a great sign for love because Mercury is retrograde the truth of a situation is not quite as transparent as you may think. If you rush into something too quickly this month you may find that it comes back to bite you. Think of what your Achilles heel is and keep an eye on it because it may not only be you who is affected. Someone will have your back and you need to be aware that your actions do not only affect you but others also. If you find yourself at odds within a situation do not come out fighting because if you do you may find you have done exactly what the other person wanted all along and as there is total balance in this image you don’t want to go rocking any boats to put yourself at a disadvantage. It may be that you are on the verge of leaving a relationship, a job or simply have had enough of your life at present and want to throw it all in and start something new. However, what you do not need is action that is not well thought out… rather you need a plan. With an eclipse in your sign on the 8th and Mercury retrograde for a large part of the month it will be difficult to see the woods from the trees but if you can imagine glimpses of your wishes coming into reality then you get the idea of what you need to do and why it is so important to hold off for the time being. Today would be a good day to take a break from work and responsibilities to focus on social activities with friends and loved ones. 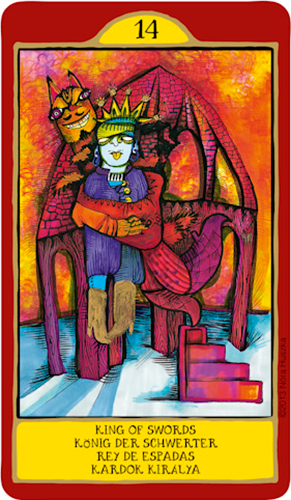 Today’s Leo Moon (still very new) fits perfectly with the sense of joy and playfulness seen in this version of the card. The three figures in this card are virtually identical: Whether they’re best friends or siblings (triplets!) the sense of sisterhood and camaraderie are emphasized here. Today you may feel like taking a break from the monotony of your daily routine and getting together with friends and loved ones. This rendition is a re-colored and “illuminated” Rider-Waite version with the traditional three young women dancing and raising their cups in celebration. Notice though how the women and their robes have been altered to highlight the differences in culture and ethnicity. This is an important feature of the Three of Cups — there’s a general sense of communion and camaraderie that knows no pettiness, no jealousy and no social bounds. Today’s Mercury / Jupiter sextile ties in perfectly with this card. Not only does it speak of interacting comfortably with others, but it encourages you to expand your social horizons and let those you have no direct understanding of or history with into your inner circle. Proudly powered by WordPress Theme: Encounters Child.